InFocus’s BigTouch interactive PC displays have been selected by MultiTaction, a provider of advanced data visualization and collaboration software solutions, to offer customers a single, large-screen, hardware and software solution for visual collaboration. 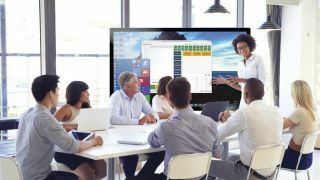 This pairing takes the guesswork out of selecting a hardware display solution that works seamlessly with MultiTaction Canvus and Canvus Connect solutions, and offers customers advanced touchscreen display technology with a powerful on-board PC in a range of sizes. The InFocus BigTouch combines the functionality of a tablet computer with a powerful Windows 10 Pro PC in a giant, capacitive touch experience for your shared work space. The on-board Windows PC has Intel Core i7 processing and solid-state hardware to run Windows apps in touch mode. With multiple touch points and projected capacitive touch technology, BigTouch is available in 57-inch and 65-inch models with 1080p or 70-inch and 85-inch models in native 4K. MultiTaction, which will do enterprise demos and seeding with InFocus hardware, offers its MT Canvus real-time collaboration software. Canvus helps visualize big data and encourages collaborative working. It enables multiple sources such as video feeds, web-based applications, and content from smart devices to run in parallel and remote users can share, manipulate, draw, and input information in real-time wherever they are based. These collaboration tools expedite communication, which means work gets done faster and more efficiently, one of the main reasons why users, including leading organizations such as IBM, Flex, and Columbia University Medical Center, rely on MultiTaction. Both the InFocus BigTouch displays as well as MultiTaction Canvus and Canvus Connect are available now.